Ubuntu Tweak, the most popular tool to tweak various Ubuntu settings as well as add third-party sources (PPAs), has reached version 0.8.0, introducing a new feature called "Apps", a combination between the already existing App Center and Source Center features. 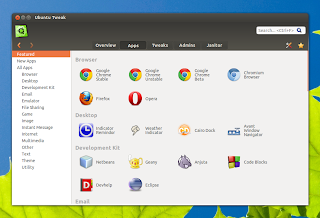 The new Apps feature displays applications which are either not available in the Ubuntu Software Center, or the version in USC is too old, which you can install or update with a click. You could already do this using the Source and App Center, but it's was a long and complicated process: you had to enable the PPA, update the cache and then install the application, and now, this process can be done with just one click. When clicking an application on the new Ubuntu Tweak "Apps" tab, you can see the available sources (PPAs) - for instance, in the screenshot above you'll notice that you can enable either the Pinta daily builds or the stable builds PPA -, along with an install / update button. The App and Source Center will continue to exist in Ubuntu Tweak untill all their features are implemented into the new "Apps" feature. Besides this feature, the latest Ubuntu Tweak 0.8.0 also comes with bug fixes, such as a bug that caused Ubuntu Tweak to crash when Janitor was preparing to remove kernel results. For now, Ubuntu Tweak 0.8.0 is only available for Ubuntu 11.10 and 12.04. Alternatively, you can download the deb from its Launchpad page. Ubuntu Tweak 0.8.0 doesn't fully support Ubuntu 12.10. You can install it, but various features may not work!